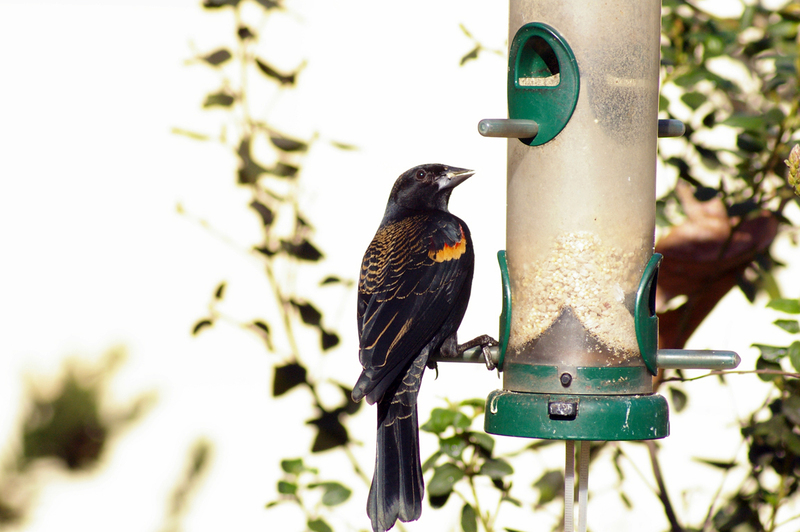 One of the most abundant birds in North America, the Red-winged Blackbird is found in wetlands and agricultural areas across the continent. 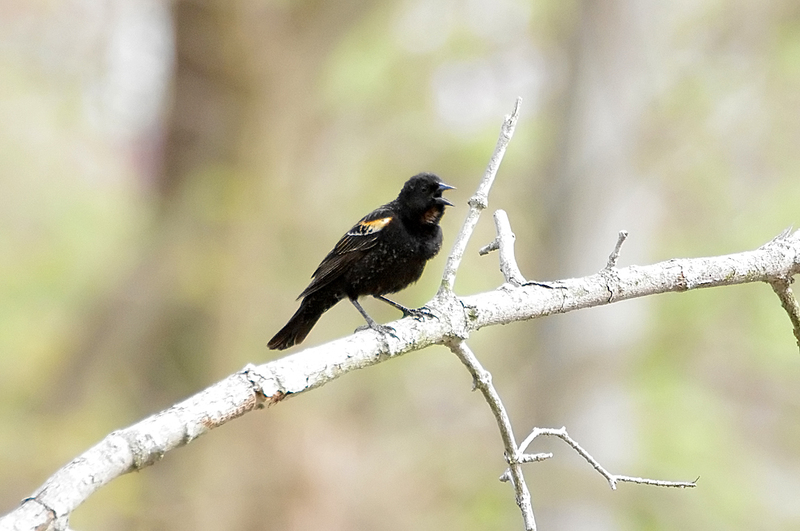 The black male can hide the brilliant red shoulders or show them off in a dazzling display. 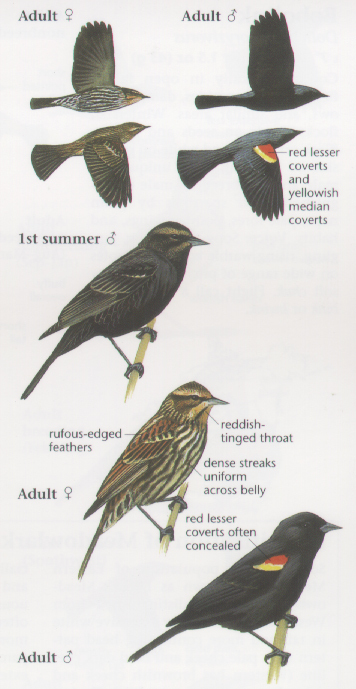 The striped female looks strikingly different than the male and could almost be mistaken for a large dark sparrow. 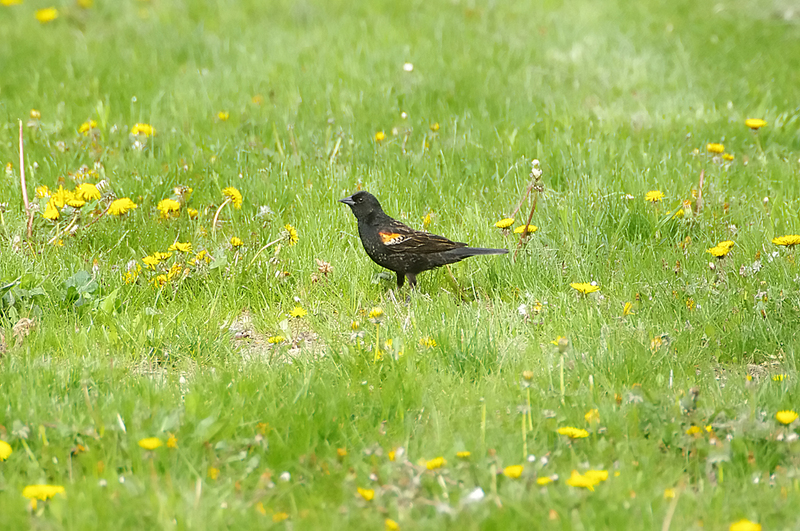 Different populations and subspecies of Red-winged Blackbirds vary markedly in size and proportions. 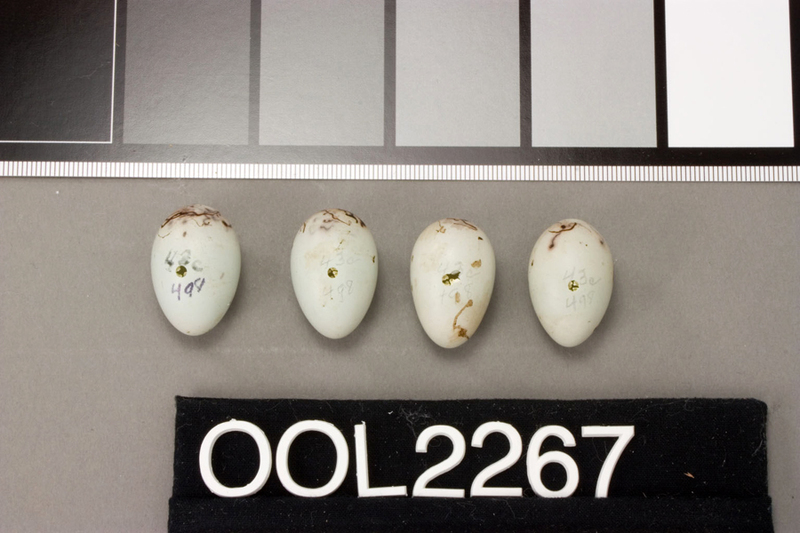 An experiment was conducted that moved nestlings between populations and found that the chicks grew up to resemble their foster parents. This study indicated that much of the difference seen between populations is the result of the different environments. 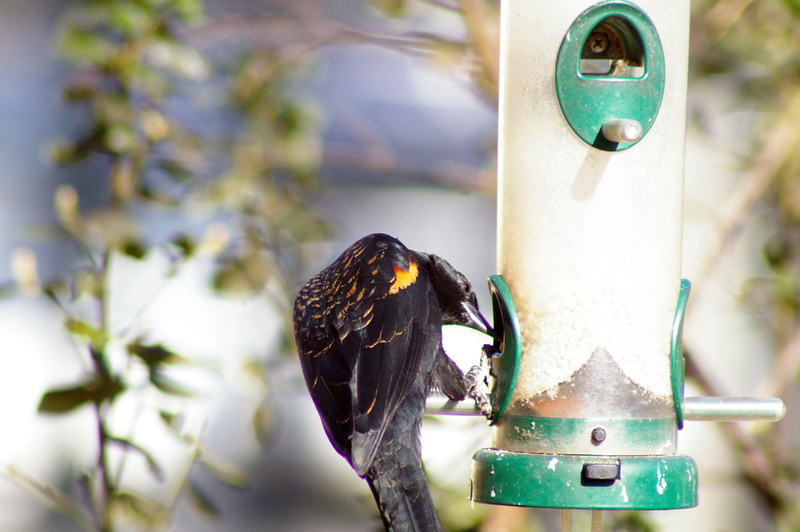 The Red-winged Blackbird is a highly polygynous species, with one male having up to 15 different females making nests in his territory. In some populations 90% of territorial males have more than one female. But, from one quarter to up to half of the young in "his" nests do not belong to the territorial male. Instead they have been sired by neighboring males. 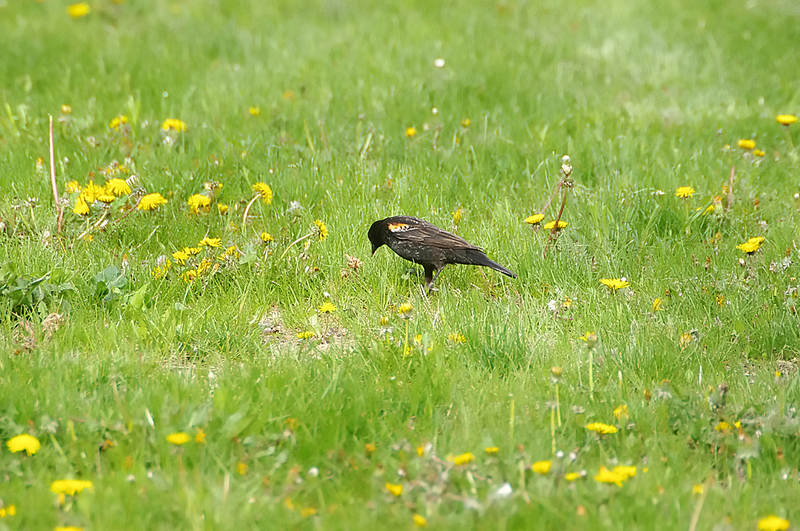 The male Red-winged Blackbird fiercely defends his territory during the breeding season. He may spend more than a quarter of all the daylight hours in territory defense. He vigorously keeps all other males out of the territory and defends the nests from predators. He will attack much larger animals, including horses and people. 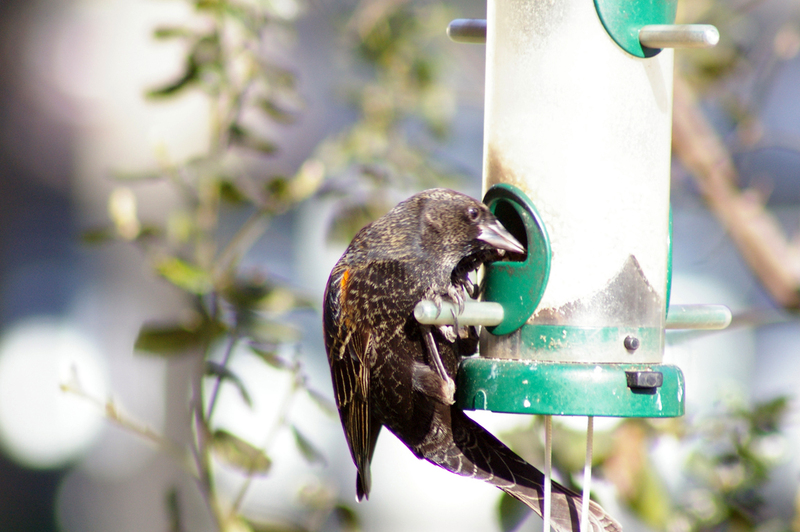 The Red-winged Blackbird forms roosting congregations in all months of the year. In the summer it will roost in small numbers at night in the wetlands where it forages and breeds. In winter, it can form huge congregations of several million birds, which congregate in the evening and spread out each morning. Some may travel as far as 80 km (50 mi) between the roosting and feeding sites. 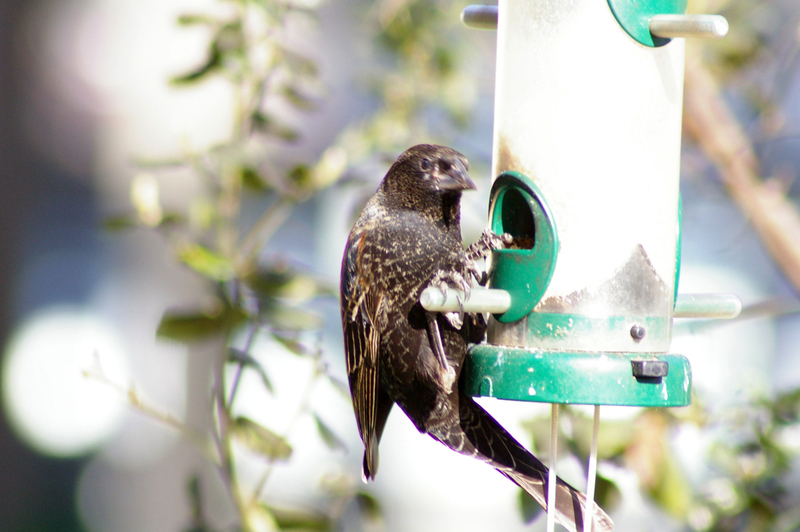 It commonly shares its winter roost with other blackbird species and European Starlings. Moderately long and slender bill. Male plumage is well described by the name. 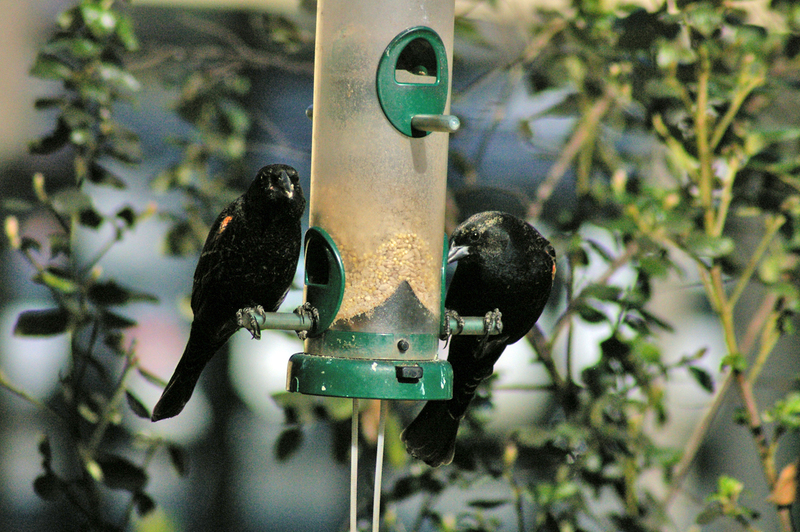 Male black with red shoulders, female brown and striped all over. Black all over; no iridescence. Red on bend of wing, with a lower border of yellow (some subspecies lack yellow). Brown and heavily streaked across chest and back. Prominent white eyestripe. Buffy throat and face. Pale stripe in middle of crown. Weak pale wingbars. Bend of wing with brown or orange-red. Undertail coverts dark with light edges. 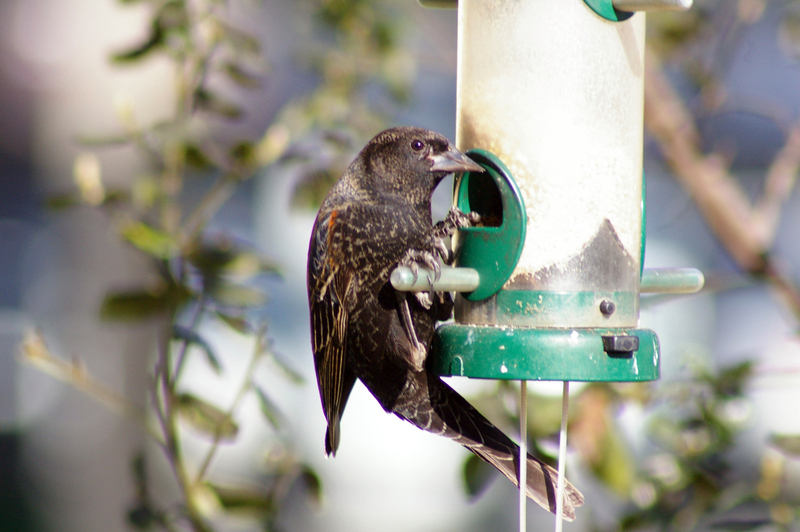 Immature male similar to female, but may be mostly black with buffy edges to feathers, and epaulettes vary from brown to red. Much variation exists, and male may take three years to become entirely black. 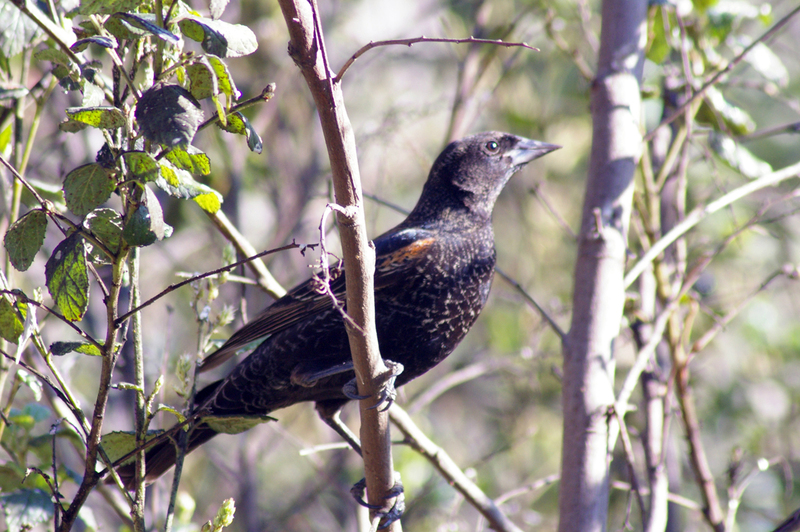 Immature female similar to adult, but has paler face and brown epaulettes. Breeds in a variety of wetland and grassy areas, including marshes, meadows, alfalfa fields, and open patches in woodlands. Probes in vegetation for insects, spreading the bill to look in plants and under objects. Gleans seeds from ground. 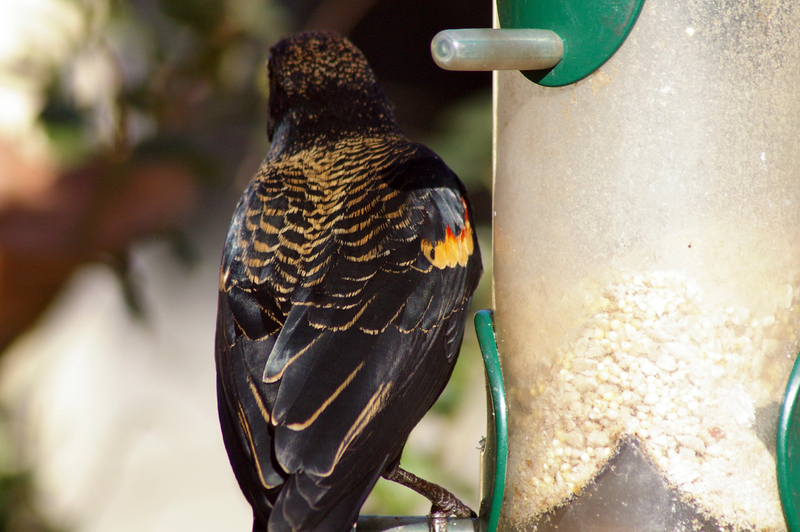 Tricolored Blackbird male has white lower edge to red shoulder. 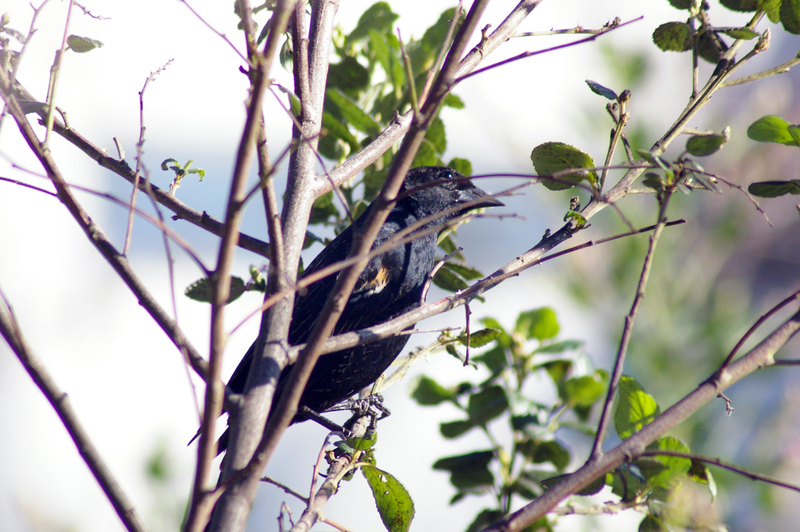 Female Tricolored Blackbird similar to red-winged, but is darker with a whitish-gray throat. Song a gurgling "oak-a-lee." Call a dry "chek" and "cheer." Yasukawa, K., and W. A. Searcy. 1995. 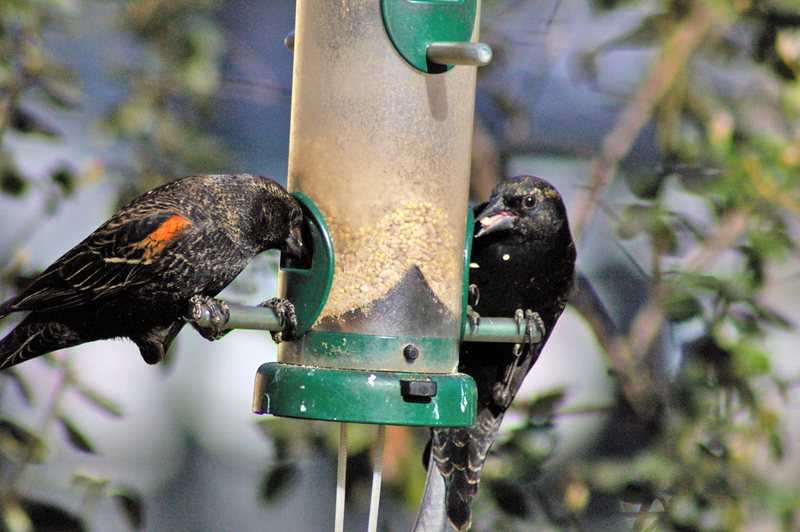 Red-winged Blackbird (Agelaius phoeniceus). In The Birds of North America, No. 184 (A. Poole and F. Gill, eds.). The Academy of Natural Sciences, Philadelphia, PA, and The American Ornithologists' Union, Washington, D.C.